Since the Hannon Jewelers family began creating jewelry in Nicaragua in 1940, we have used the best precious metals alloys for our creations. We match our customer to the color of the gemstones, the color and property of the alloys to the intended use of the jewelry creation. 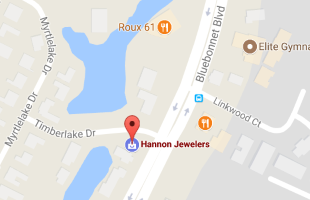 At Hannon Jewelers, we offer a wide variety of metals and metal purity. Every precious metal needs alloys to make it strong and durable, and we build our metals to the highest of standards. Listed below are some of the basic metal choices that we offer. Pure gold: (fine gold) is softer than pure silver but harder than tin. Its beauty and luster are unmatched by any alloyed gold’s. The extreme malleability, ductility, and softness of pure gold make it practically useless for jewelry applications. Alloys Added for Strength: The additions of alloying elements (other metals) to gold are used to increase the toughness and hardness of the metal. While almost any metal can be alloyed (melted) with gold, only certain metals will not dramatically change the color or make the metal brittle. For instance, the traditional 14 Karat gold contains fourteen parts of pure gold and ten parts of other metals such as silver, copper and nickel. Various degrees of workability are achieved by changing these combinations. In making a gold alloy, each component metal is carefully weighed and placed in a crucible. The metals are then heated together to over 1900 degrees F, stirred for homogeneity and purred into a mold. 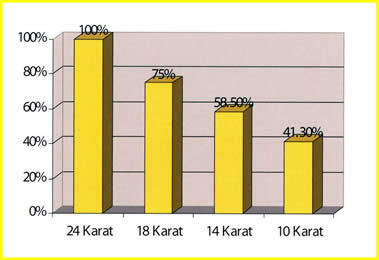 10-Karat gold or 416 refers to 41% pure gold in the content. Pure gold, or 24 Kt., has no variation in color. It is always that rich warm yellow. However, it can be manufactured in a wide variety of colors-including pink, white, green, blue or gray-by being mixed with different metals. For example, when silver and copper are added to pure gold, it turns yellow. When nickel or palladium (or zinc and copper) are added, gold turns white. Pure gold combined with silver, copper and zinc results in green gold. And pink gold is made when copper is mixed with pure gold. A higher proportion of copper produces a reddish hue. If nickel (or iridium) is a major additive, the gold alloy becomes white. The addition of indium, for instance, turns gold purple and gives gold the workability of glass. As the industry advance in research, more and newer color alloys are entering the market. New shades of brown, amber, gray, black, and deeper green are created by the traditional method of alloying and also by galvanization. The term gold filled refers to the manufacturing process in which an ingot of base metal, usually copper, is bonded with thinner ingots of gold. A "sandwich" is formed by mechanically bonding a layer of gold on both sides of the copper ingot. This "sandwich" is then cold worked by rolling or drawing until a much thinner gauge metal is achieved. Products are then formed or die-struck from this layered material. The object is then gold plated to hide the edges, as they would otherwise reveal the sandwiched construction. Although gold-filled product is readily available today, this process was most popular in the early 1900's. 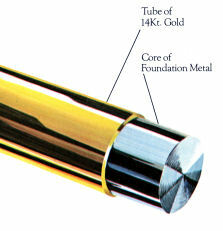 Hallmarking will appear as 1/20th 14k gold filled, indicating that by weight, 1/20th of the metal content of the product is 14k gold. 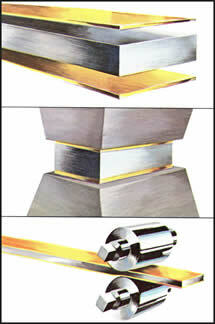 Rolled gold: Plate refers to the same process; however the gold content is lower; for example, 1/30th 12k. In your question, the reference to white and yellow is simply an indication of the color of the gold used. The advantages of this product are that the gold layering is much thicker, and longer wearing, than gold plating. 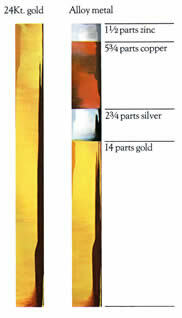 It is also much less expensive than a similar product made of all 14k material. Gold filled Wire: Wire is made using a similar process except that a core of foundation metal is inserted into a tube of gold. The bonded tube and core is then drawn through reducing dies having progressively smaller diameters until the desired diameter is attained. Gold Electroplate: When a product is referred to as gold, rhodium, or nickel-plated, this indicates that it has been electroplated with a thin layer of that particular metal. The terms gold electroplate, or gold plated, indicates that it is created by a plating process which deposit a very thin "coloring" of gold - seldom over 10 micro inches. Even heavy gold electroplating is only 100 micro inches thick. Gold electroplated items look good when new. Yet, the gold film is usually very soft, wears through quickly. This means the base metal is then exposed, given the piece of jewelry a worn and tarnished look. Gold wash or gold Flashed: A coating that is any thinner must be marked gold flashed or gold washed. When the base metal is sterling silver this process is known as Vermeil. Any alloy selection for the creation of White Gold is a compromise between color or appearance, alloy properties in jewelry fabrication, and cost. Nickel and Palladium are the most common bleaching agents used to give gold a white color. What alloys is used, will define the resulting white gold properties and whiteness. High Nickel Content: Provides a bright, metallic white gold color but is not as malleable as lower nickel alloys. Also this resulting mix is more susceptible to cracking. This is specially important on prongs which may be brittle and may crack easier that other alloys. Low Nickel content: Jewelers may prefer this mix because it can work better for fabrication. It is prone to stress corrosion. May have a yellowish tin and may require rhodium plating. High Palladium Content: This alloy has a soft white color; it is more expensive but it is nickel free and less hypoallergenic. It is also resistant to stress corrosion and cracking. Low Palladium Content: Off-white color and may require rhodium plating. It is resistant to stress corrosion and cracking. Platinum is one of the rarest of metals. It is more pure, rarer, and more durable for jewelry use. It is more expensive than gold since every year only 88 tons of platinum is made into jewelry compared with 2700 tons of gold. Platinum is hypoallergenic for those people with sensitivity to some metals. At wear, it remains white with an acquired slight patina which make it unique. When permanent whiteness is required, platinum is the white metal of choice, as it is by nature, white and virtually impervious to chemical attacks. Platinum and Gold are both precious metals. However, each have a completely different chemical composition and properties. White gold was created as an alternative to Platinum more than a century ago. It became more popular in the 1940's when platinum was not available. As pure gold is always yellow by nature, it is mixed with allows to "bleach" it white. This common alloy was originally nickel. But since nickel may produce an allergic reaction to some people, new alloys are now used, like palladium. Many connoisseurs consider platinum the ultimate precious jewelry metal. When platinum emerges from the ground, it is naturally white. Platinum stays naturally white forever with no added maintenance. Platinum is also approximately 60 times more rare than gold. New polished platinum has a bright white metal color. However, in time, the platinum piece will develop a grayish-white color or patina due to the surface scratches. Some people will feel the need to polish this jewelry more often to keep the “clean or new” look that is commonly desired. Pure gold is yellow. White gold is yellow gold that has had other alloys added to it to make it appear white. New polished white gold has a bright white metal color. Depending of the type of alloys used in the fabrication of white gold, white gold jewelry tends to have a faint yellowish tint with wear. In these cases, white gold can be rhodium-plated to restore the bright white appearance of your jewelry. Rhodium is a member of the platinum family. It is common to electroplate Rhodium for consistency and uniformity of other white metal color used in jewelry. You would like to know that new innovated alternatives to alloying gold to make it white are available. This new gold alloys used no nickel and instead, palladium is mixed to produce a metal which has superior whiteness that needs no rhodium plating. Most Hannon Jewelers creations are available in all precious metals. You may select gold in all of its colors or white colored metals to enhance the color and brilliancy of your diamond jewelry. However, selecting the type of metal is a personal choice. Restoration / can be made to look new again? Like all precious metals, platinum and white gold do scratch. If a platinum or gold piece has a high-polish finish, scratches are actually easier to spot, because of the high contrast between the polish and the scratch. Platinum is a much denser metal. Its chemical composition has a more compact concentration of material per unit than gold. This means your platinum jewelry is heavier and will wear longer than white gold. Ninety percent platinum weighs sixty percent more than 14-karat gold. These two properties - being denser and softer than gold, mean that when platinum is scratched, no metal is lost. The metal is merely adjusted to allow room for the scratch. This means that platinum does not lose the minuscule amount of metal that disappears when other precious metals are scratched. This explains why design work and engravings last much longer on platinum jewelry. White gold is a harder metal than Platinum. This means that its surface is more resistant to scratches than platinum. Also, white gold is less malleable. White gold needs more pressure to bend than what is required by platinum. This means that white gold prongs holding diamonds are more resistant to bending than platinum. Most diamond jewelry now has white gold mountings and prongs. It is important to realize that when comparing these two metals, we are talking about relative marginal differences in toughness and hardness. Both metals are strong enough to withstand normal wear and tear for your jewelry. While platinum lasts longer, it is also softer (scratches more). Platinum it is more malleable therefore is easier to hammer or press into shape without breaking or cracking. I've heard that platinum is harder to work with than gold. Platinum and white gold like other metals can be worked on or altered by a qualified jeweler. Platinum is different to work on than gold, but not more difficult for a qualified and skilled craftsman. ( Some jewelry shops do not have craftsmen skilled to work with platinum ) Platinum has a much higher melting point than other precious metals and it can be easily contaminated if mishandled. Therefore, platinum requires special procedures, chemicals and equipment which make the process of creating platinum jewelry more costly. Most jewelry craftsmen are well equipped to work with gold and all its alloys. Most jewelry shops are qualified to cast gold jewelry locally. Casting platinum jewelry requires specialized shops outside the scope of your local jewelry retailer or custom jewelry shop. Why does platinum cost more? Yes, platinum jewelry does cost more. Platinum is a purer metal. It is most common manufactured at 95 percent purity. (90 or 95 percent pure in most cases) Platinum is rarer, currently raw platinum double the price of gold by the ounce and because it is nearly two-thirds denser than gold, the same ring in platinum weights much more than gold. In addition, we already addressed the fact that the cost of labor and special equipment required in the fabrication of platinum jewelry are higher. These four factors makes a multiplying effect to the fact that platinum jewelry can cost up to five times as much as the same piece manufactured in gold. The chief use of Platinum (and Palladium as well) is industrial. The price for both metals is driven more by demand for automobiles (catalytic converters that clean automobile emissions) and electronics (used to coat computer hard-disks drivers and to make liquid crystal displays for TV's and computers. Palladium is also used as semiconductor). Therefore, prices for these metals tend to move in synch with the global economy. Market Price for Gold is lower than that of Platinum. Pure gold is found in more places and quantities in the world with more supplies available in the market. 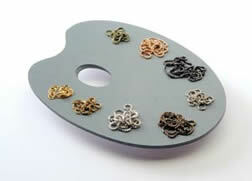 These combinations of gold and alloys also make to finished jewelry more affordable than platinum. 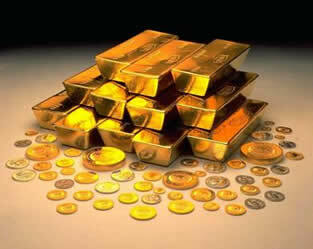 The price for Gold is also affected by economic fluctuations. While Gold is common in jewelry, its use for industry is limited. The key demand driver is investors looking for some protection against inflation and currency risks. When fear in the economy is high, gold prices are typically high too. Most gold allows used in the fabrication of fine jewelry is made at 75% (18K) or 58.33% (14K) purity. 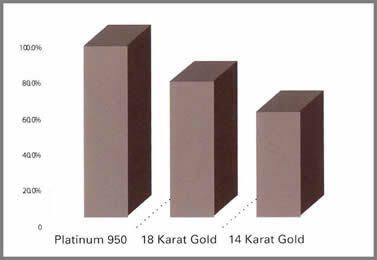 Therefore we can not really compare the cost of white gold to the price of 95% pure platinum. How do I know what kind of metal I am buying? If you are buying your jewelry from a reputable jeweler, it is relatively easy to check to see if the jewelry you're buying is platinum or gold. All jewelry sold in the U.S. must be stamped with a common quality mark that shows the percentage of platinum or gold used in the metal. These marks are, most commonly: Platinum, Plat, or Pt. followed by the percentage of platinum used, for example: Pt. 1000 (pure platinum), Pt999 (999 parts per thousand platinum and one part other metal). Other common platinum alloys are: 950Pt (or 950Plat or Pt950) which is 950 parts per thousand platinum and 50 parts other metals; 900Pt (or 900PIat or Pt900) which is 900 parts per thousand platinum and 100 parts other metals; and 850Pt (or 850PIat or Pt850) which is 850 parts per thousand platinum and 150 parts other metals. Any jewelry item containing 950 parts platinum or better could be marked with only Platinum or Plat. Pure Gold is 24-Karat and is always 100% pure. refers to 41% pure gold in the content. White gold is less expensive than platinum. It's almost the same color. Should I buy White Gold instead? If you look closely at both white gold and platinum, you will see that the color and the look are not entirely the same although they both have a white metallic appearance. When new, it is very difficult and sometimes impossible to tell the two metals apart. We do not recommend having two rings, one made out of gold and the other made in platinum side by side since the color differences will be enhanced this way. Your personal life style, family traditions, expectations and budget are important considerations In your personal research and selection of your jewelry. Share your ideas with your personal jeweler who will help you analyze which metal is best for you now and for the future. Why does gold discolor the skin? Your may think that faulty manufacturing or underkarating might be the problem when a ring "turns," blackening or discoloring the skin and clothing, or the jewelry itself. Hannon Jewelers can test the metal in your jewelry to verify its content. However, if underkarating is not the case, this is a brief discussion on understand the causes, and how to prevent them. To prevent this, you should try switching cosmetics. If this is not possible, we recommend that you remove rings and other jewelry while applying them, and clean skin areas in contact with jewelry with soap and water. When your perspires, fats and fatty acids released can cause corrosion of 14-karat gold, especially when exposed to warmth and air. This problem can be worse in seacoast and semitropical areas, where chlorides combine with perspiration to form a corrosive element that discolors skin. Smog fumes gradually attack jewelry and are evident as a tarnish that rubs off on the skin. We suggest to remove jewelry often and use an absorbent powder, free of abrasives, on skin that comes into contact with jewelry. The same can be said about allergy reactions to the alloys used in gold jewelry. We know of allergy reaction to silver, cooper, and nickel. In this case, we often suggest to use a purer gold alloy like 18K or a white gold with no nickel content. We know of no allergy reaction to Platinum as this metal in its traditional form is a pure metal. It may be a good idea to remove all rings before using soaps, cleaning compounds or detergents, and clean their rings frequently. In addition to these corrective actions, we do recommend that customers with this problem may switch to 18-karat gold or platinum. The lower alloy content of 18-karat gold—25%, versus almost 42%—significantly reduces the problem, and the use of platinum - because of its purity - should eliminate it completely.